Romare Bearden mined a wide range of sources: the Bible, the writings of French satirist François Rabelais, his childhood memories of Mecklenburg County in North Carolina, the people and streets of Harlem, the epic poems of Homer, and more. He revisited many of these themes time and time again. Thus he made ink drawings and watercolors inspired by Homer’s Iliad in the 1940s, and a series of twenty collages based on The Odyssey in 1977. Bearden’s collages drew strong praise when they were exhibited at the Cordier & Ekstrom Gallery in New York’s Upper East Side in the spring of 1977, and he went on to make watercolor versions around the same time. About two years later, he translated six of the collage compositions into screenprints, which were published as the Odysseus Suite in 1979. In Home to Ithaca, the fourth print of the suite, Bearden added a twist. Homer relates that Odysseus was asleep on the ship’s deck when his vessel sailed into Ithaca’s harbor. But Bearden portrays Odysseus poised triumphantly on the ship’s bow, a shield in one hand and a spear in the other. In creating a black Odyssey—all the figures in the suite are dark skinned—Bearden not only cast Homer’s tale in unconventional terms, he underscored the myth’s universality, such that a “child in Benin or [one] in Louisiana,” in his words, would appreciate its relevancy. Three Centuries of American Prints: from the National Gallery of Art, National Gallery of Art, Washington; National Gallery in Prague, Prague 1; Antiguo Colegio de San Ildefonso, Mexico City; Dallas Museum of Art, Dallas, 2016 - 2017, no. 135. Gelburd, Gail and Alex Rosenberg. 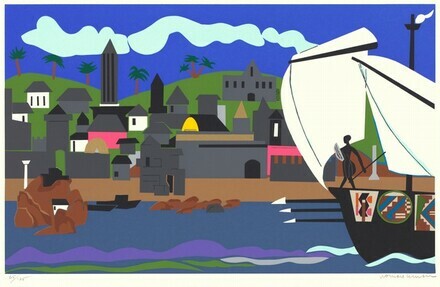 A Graphic Odyssey: Romare Bearden as Printmaker. Exh. cat., University of Pennsylvania Press, 1992: 49.